In a neoadjuvant setting, three parameters for Ki-67 could be obtained: pre-treatment Ki-67, post-treatment Ki-67 and Ki-67 change between pre- and post-treatments. It is uncertain which of the three parameters has the greatest prognostic significance, and whether this parameter has significance in each subtype of breast cancer. 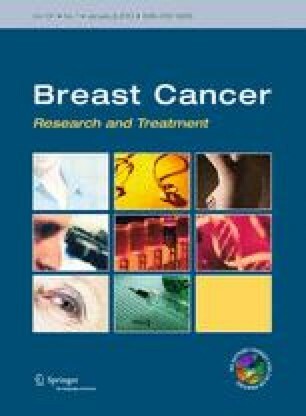 A total of 385 patients who received neoadjuvant anthracycline followed by taxane chemotherapy and subsequent surgery for breast cancer were analyzed retrospectively. By immunohistochemistry (IHC), patients were divided into four subtypes (Luminal A, Luminal B, Triple negative, and HER2). Ki-67 was examined by IHC in pre-treatment core needle samples and post-treatment surgical excision specimens. The relapse-free survival (RFS) rate was compared among each subtype. The median follow-up period was 56 months. The rate of pathological complete response was higher for HER2 (34.8 %) and Triple negative (24.3 %) subtypes than for Luminal B (8.3 %) and Luminal A (3.8 %) subtypes (p < 0.0001). A reduction in Ki-67 was observed in 58.5, 83.4, 70.2, and 74.2 % of patients in the Luminal A, Luminal B, Triple negative, and HER2 subtypes, respectively. Ki-67 change between pre- and post-treatments was an independent prognostic factor, but pre-treatment Ki-67 and post-treatment Ki-67 were not independent prognostic factors in a multivariate analysis. The RFS was significantly different between patients whose Ki-67 was reduced and those not reduced for Luminal B (81.4 vs. 50.0 %, p = 0.006), Triple negative (74.8 vs. 43.5 %, p = 0.006) and HER2 (82.7 vs. 59.0 %, p = 0.009). However, for Luminal A, the difference in RFS was not associated with changes of Ki-67 (78.8 vs. 75.3 %, p = 0.193). Ki-67 change between pre- and post-neoadjuvant chemotherapy is an independent prognostic factor in patients of Luminal B, Triple negative, and HER2 subtypes. Pre-treatment Ki-67 and post-treatment Ki-67 were not independent prognostic factors in a multivariate analysis. The study was carried out in accordance with the Declaration of Helsinki and Japanese ethical guidelines for epidemiological research.